BGJ398 (NVP-BGJ398) is a potent and selective FGFR inhibitor for FGFR1/2/3 with IC50 of 0.9 nM/1.4 nM/1 nM in cell-free assays, >40-fold selective for FGFR versus FGFR4 and VEGFR2, and little activity to Abl, Fyn, Kit, Lck, Lyn and Yes. Phase 2. Activation of FGFR2 and MAPK by FGFR2-AHCYL1 and its suppression by FGFR inhibitors. Lysates from NIN3T3 cells expressing FGFR2-AHCYL1 or EZR-ROS1 (control) treated with vehicle (DMSO), 0.2 and 1 µM BGJ398, and 0.2 and 1 µM PD173074 were immunoblotted with the relevant antibodies. β-actin was used as a loading control. Hepatology 2014 59(4), 1427-34. BGJ398 (NVP-BGJ398) purchased from Selleck. Anchorage-independent growth of NIN3T3 cells expressing FGFR2 fusions and its suppression by FGFR inhibitors (BGJ: BGJ398 and PD: PD173074). The percentage (+/- s.d.) of colonies formed in the presence of FGFR2 inhibitors (0.2 礛) and by KD mutants with respect to those formed by DMSO-treated cells are plotted at the bottom. The NIH3T3 clone expressing EZR-ROS1 was used as a negative control for FGFR inhibitors. *P<0.05. E, Continuous ERK phosphorylation in FGFR inhibitor resistant cells under 24-hour treatment with 1 μmol/L BGJ398 assessed by immunoblotting. Clin Cancer Res, 2017, 23(18):5527-5536. BGJ398 (NVP-BGJ398) purchased from Selleck. Cells with the indicated gene alterations were serum starved overnight and then treated with BGJ398 at the indicated concentrations for 6 hours. Cell extracts were immunoblotted to detect the indicated proteins. Cancer Res, 2015, 75(15):3139-46. BGJ398 (NVP-BGJ398) purchased from Selleck. Oncogene, 2017, 36(27):3831-3841. BGJ398 (NVP-BGJ398) purchased from Selleck. BGJ398 inhibits signaling in cell lines with activating FGFR alterations. Immunoblot demonstrates the expression of total/pFGFRs and total/pFRS2 in DMSO and BGJ398 in treated cell lines (A) DMS114. B, RT112. Lysates were prepared from cells exposed to BGJ398 (at the indicated concentrations) for 24 hours and immunoblots performed with the respective antibodies. Representative data are shown from three experimental replicates. Bar graphs display densitometric analysis of protein bands using GAPDH as a control. BGJ398 treatment results in decreased levels of pFGFR1/pFGFR3 and pFRS2/total FRS2, respectively. Mol Cancer Ther, 2017, 16(4):614-624. BGJ398 (NVP-BGJ398) purchased from Selleck. BGJ39 distinctly inhibited the inductive effect of FGF2. Just as the results of western blot, BGJ39 not only reversed the down-expression of E-cadherin, but also weakened the expression of BSP and OPN. However, combination of both TGF- β1 and FGF2 containing BGJ39 distinctly improved the expression of fibronectin and periostin. β-actin was used as an internal control for equal protein loading. * P < 0.05, ** P < 0.01. J Cell Physiol 2014 229(11), 1647-59. BGJ398 (NVP-BGJ398) purchased from Selleck. The enzymatic kinase activity is assessed by measuring the phosphorylation of a synthetic substrate by the purified GST-fusion FGFR3-K650E kinase domain, in the presence of radiolabeled ATP. Enzyme activities are measured by mixing 10 μL of a 3-fold concentrated BGJ398 solution or control with 10 μL of the corresponding substrate mixture (peptidic substrate, ATP and [γ33P]ATP). The reactions are initiated by addition of 10 μL of a 3-fold concentrated solution of the enzyme in assay buffer. The final concentrations of the assay components are as following: 10 ng of GST-FGFR3-K650E, 20 mM Tris-HCl, pH 7.5, 3 mM MnCl2, 3 mM MgCl2, 1 mM DTT, 250 μg/mL PEG 20000, 2 μg/mL poly(EY) 4:1, 1% DMSO and 0.5 μM ATP (γ-[33P]-ATP 0.1 μCi). The assay is carried out according to the filter binding (FB) method in 96-well plates at room temperature for 10 minutes in a final volume of 30 μL including BGJ398. The enzymatic reactions are stopped by the addition of 20 μL of 125 mM EDTA, and the incorporation of 33P into the polypeptidic substrates is quantified as following: 30 μL of the stopped reaction mixture are transferred onto Immobilon-PVDF membranes previously soaked for 5 minutes with methanol, rinsed with water, soaked for 5 min with 0.5% H3PO4, and mounted on vacuum manifold with disconnected vacuum source. After spotting, vacuum is connected, and each well rinsed with 0.5% H3PO4 (200 μL). Free membranes are removed and ished four times on a shaker with 1% H3PO4 and once with ethanol. Membranes are dried and overlaid with addition of 10 μL/well of a scintillation fluid. The plates are eventually sealed and counted in a microplate scintillation counter. IC50 values are calculated by linear regression analysis of the percentage inhibition of the BGJ398. Method: Murine BaF3 cell lines, whose proliferation and survival has been rendered IL-3-independent by stable transduction with tyrosine kinases activated either by mutation or fusion with a dimerizing partner, are cultured in RPMI-1640 media supplemented with 10% FBS, 4.5 g/L glucose, 1.5 g/L sodium bicarbonate, and Pen/Strep. Cells are passaged twice weekly. BGJ398-mediated inhibition of BaF3 cell proliferation and viability is assessed using a Luciferase bioluminescent assay. Exponentially growing BaF3 or BaF3 Tel-TK cells are seeded into 384-well plates (4250 cells/well) at 50 μL/well using a μFill liquid dispenser in fresh medium. BGJ398 is serially diluted in DMSO and arrayed in a polypropylene 384-well plate. Then 50 nL of BGJ398 are transferred into the plates containing the cells by using the pintool transfer device, and the plates incubated at 37 °C (5% CO2) for 48 hours. Then 25 μL of Bright-Glo are added, and luminescence is quantified using an Analyst-GT. Custom curve-fitting software is used to produce a logistic fit of percent cell viability as a function of the logarithm of inhibitor concentration. The IC50 value is determined as the concentration of BGJ398 needed to reduce cell viability to 50% of a DMSO control. Guagnano V, et al. J Med Chem. 2011, 54(20), 7066-7083. If you have any suggestions about the formulation of this compound for a direct oral gavage administration? BGJ398 (S2183) can be dissolved in 30% PEG400/0.5% Tween80/5% Propylene glycol at 30 mg/ml as a suspension. PD173074 : FGFR1-selective, IC50=~25 nM. Ponatinib (AP24534) : Approved by FDA for resistant or intolerant CML and Ph+ ALL. SSR128129E New : Orally-active and allosteric FGFR1 inhibitor with IC50 of 1.9 μM, while not affecting other related RTKs. 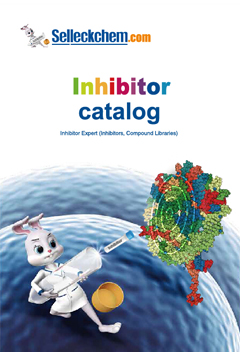 Dovitinib (TKI-258, CHIR-258) : Multitargeted RTK inhibitor for class III (FLT3/c-Kit), class IV (FGFR1/3) and class V (VEGFR1-4) RTKs. 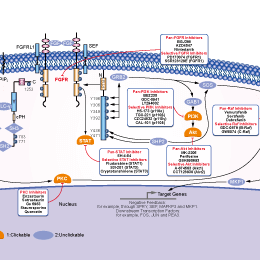 CH5183284 is a selective and orally available FGFR inhibitor with IC50 of 9.3 nM, 7.6 nM, 22 nM, and 290 nM for FGFR1, FGFR2, FGFR3, and FGFR4, respectively. Phase 1. BLU9931 is a potent, selective, and irreversible FGFR4 inhibitor with IC50 of 3 nM, about 297-, 184-, and 50-fold selectivity over FGFR1/2/3, respectively. PD173074 is a potent FGFR1 inhibitor with IC50 of ~25 nM and also inhibits VEGFR2 with IC50 of 100-200 nM in cell-free assays, ~1000-fold selective for FGFR1 than PDGFR and c-Src. AZD4547 is a novel selective FGFR inhibitor targeting FGFR1/2/3 with IC50 of 0.2 nM/2.5 nM/1.8 nM in cell-free assays, weaker activity against FGFR4, VEGFR2(KDR), and little activity observed against IGFR, CDK2, and p38. Phase 2/3. Features:Greater selectivity for FGFR1-3 over FGFR4. AZD4547 is active against the tyrosine kinase activity of both the wild-type and mutant forms of FGFR. SSR128129E is an orally-active and allosteric FGFR1 inhibitor with IC50 of 1.9 μM, while not affecting other related RTKs. LY2874455 is a pan-FGFR inhibitor with IC50 of 2.8 nM, 2.6 nM, 6.4 nM, and 6 nM for FGFR1, FGFR2, FGFR3, and FGFR4, respectively, and also inhibits VEGFR2 activity with IC50 of 7 nM. Phase 1.